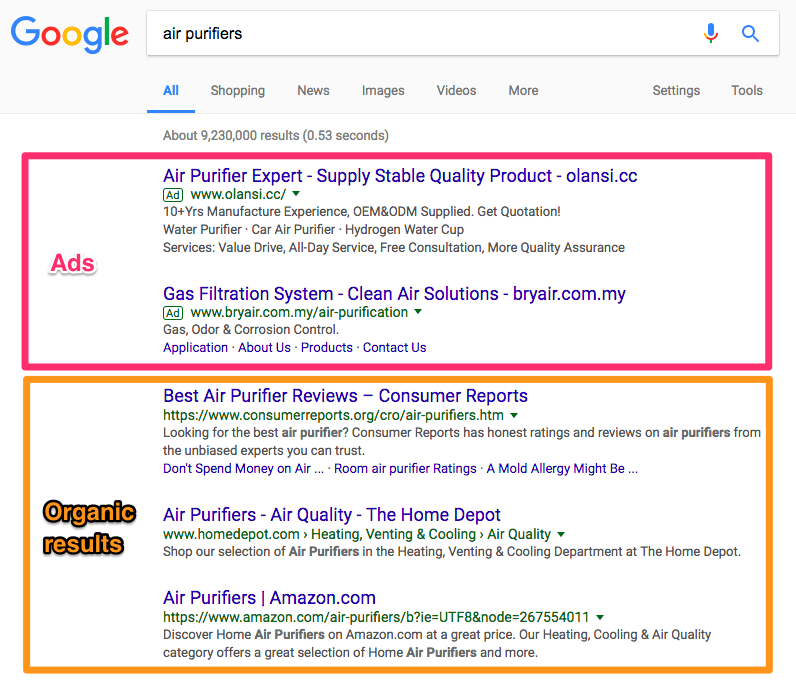 Amazon AdWords (Google Ads for Amazon Products): The Ultimate Guide. Want to grow your Amazon business with digital ads? We made a free video course, so you never miss a step! This chapter will guide you through setting up an Amazon AdWords campaign for your Amazon product. Why bother? According to a survey, 25% of Amazon sellers use AdWords. There’s a reason a quarter of all Amazon sellers are using AdWords: it works. By implementing Google AdWords correctly, you’ll be able to grow your Amazon sales and Best Sellers Rank. You’ll also have a competitive edge over the 75% or so of sellers who don’t run AdWords. Google AdWords lets you show ads to people that search for specific search terms (called keywords) in Google. There are 2 parts to a Google search result. These are the search results that are ranked by Google’s secret algorithm. AdWords can work very well for Amazon businesses. It’s a great way to drive external traffic to your product listing, so you can make more sales and improve your Best Sellers Rank. You could either build this landing page yourself, or use a landing page tool such as our own product – LandingCube. The purpose of this approach is not necessarily to have a positive return on investment on your campaign. Depending on how big your discount is, this might be hard to pull off. Build an email list. You can turn this into your own launch list in the future. Boost your sales velocity. This means you rank higher on Amazon and get more sales. With this in mind, let’s get started. The rest of this guide walks you through setting up your first AdWords campaign for your Amazon product. We’ll assume you’ve already created your landing page. If you don’t have an AdWords account already, go to adwords.google.com and set up an AdWords account. Tip: If you’ve never used AdWords before, you may be eligible for a $75 coupon from Google. Click here to learn more. A keyword is the phrase (or “search term”) that someone searches for. 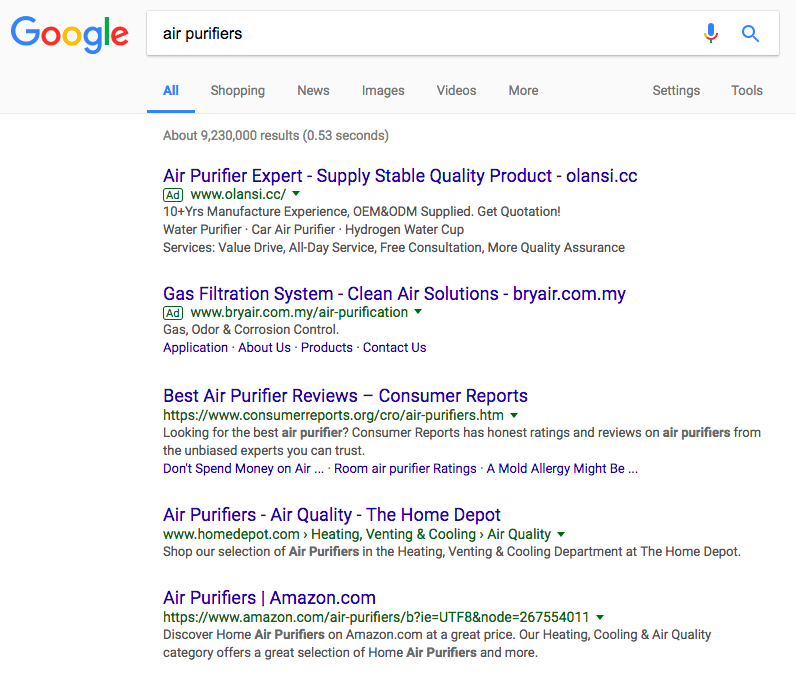 If you type “air purifiers” into Google, your keyword is “air purifiers”. Choosing the right keywords is an important part of a successful AdWords campaign. You want to make sure your keywords are as relevant as possible, otherwise you’ll be wasting money on low-quality keywords that don’t convert. To begin keyword research, navigate to Google’s Keyword Planner. An easy way to start is to paste your landing page into the keyword planner, and hit Get Ideas. Google will now build a list of keywords, along with search volume, suggested bid, and miscellaneous information. Now, find the keywords that are closely related to your product. In this example, we’re giving away a Pusheen plush cat toy. The keyword pusheen (the name of a cat) is too broad, while pusheen plush toy or pusheen birthday plush are highly relevant. Click the blue arrow (Add to plan), and download the plan to get a spreadsheet containing your keywords for later use. Leave the keyword tool and go back to the AdWords interface. In the left-hand sidebar, navigate to Campaigns and click the + button. As your goal, select Sales. Under Setup details, choose Get website visits and paste your landing page URL. Give your campaign a name. For best results, disable Include Google search partners and Add Display Network. Assuming you’re targeting customers in the USA, choose United States as your location, and English as your language. Next, choose your bidding strategy. For maximum control, choose Manual CPC (you can leave Enhanced CPC turned on). Choose a daily budget. Better start off small, for example with $5. Also make sure to set an end date, otherwise your ads will run indefinitely. Now, click SAVE AND CONTINUE. The next step is to create your ad groups. An ad group contains both ads and related keywords. Each AdWords campaign must contain at least one ad group. Google will automatically suggest keywords based on your landing page content. This is where you’ll add keywords to your ad groups. You can use Google’s keywords suggestions here, as well as keywords from the spreadsheet you created earlier when researching keywords. For each ad group, you’ll have to set a default bid. You can start off with $1 (AdWords will tell you if your bid is too high or too low) and add at least one keyword. Make sure you only add closely related keywords to each ad group. The best approach is to have very few keywords per ad group. Why? In the next step, we’ll be creating ads for all of our ad groups. You’ll want to make sure each ad is highly related to the keywords in your ad group. For example, we’ll put [pusheen cat plush] and [pusheen plush] into the same ad group, while [pusheen stuffed animal] goes into another group. And we’re done. Click “SAVE AND CONTINUE”. Great – we’re ready to write some ads. Creating ads that convert is all about copywriting. Use your keyword in your ad. Ads that include your keywords will get more clicks, as Google highlights these words in bold. Include a call to action, such as “Buy Now”, “Learn More”, or “Claim Your Coupon”. Are you giving a big discount? Only limited units left? Mention this in your ad text. Capitalize All Words. Extensive Testing Has Shown That Ads Where All Words Begin With A Capital Letter Have Higher Click-Through Rates. For more tips and examples of successful ads, read this post. Last, click SAVE AND CONTINUE. When it comes to paid traffic, you’ll always want to measure conversions. If you don’t track conversions, you’re essentially flying blind. Which keywords are working for you. What your cost per conversion is. What your conversion rate is. Track a conversion when someone clicks through to Amazon. Track a conversion when someone claims a coupon in exchange for their email address. The actual implementation of AdWords conversion tracking depends on your landing page tool. To get started, Google has a good tutorial on setting up conversion tracking. If you use LandingCube, you can track AdWords conversions using our Google Analytics integration. Set up Google Analytics for your landing page with one click, and create a Google Analytics goal for the ClickToAmazon event LandingCube triggers. Then, import your Google Analytics goal into AdWords Conversion Tracking. Once conversion tracking is set up, you’ll be able to track your ad campaign’s effectiveness. This chapter only scratches the surface of teaching how to use Google AdWords. Even so, if you’re following our recommendation to offer big discounts on your landing page you’ll likely see good results, even if you’re not an AdWords expert. Almost done: complete this form and click the button to get your FREE VIDEO COURSE!